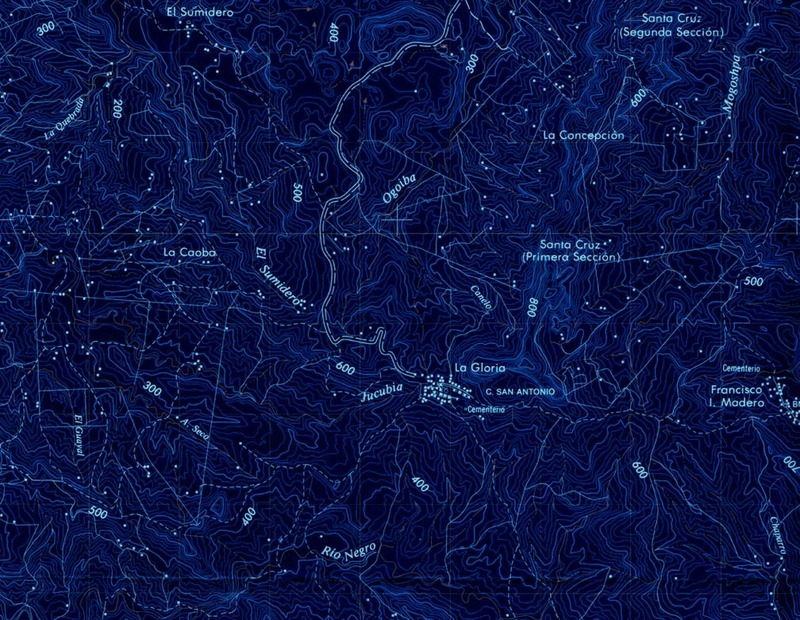 Objectives: In May of 1981 a reconnaissance trip to the Santo Domingo Canyon was fielded to look for resurgence springs for Sistema Huautla. 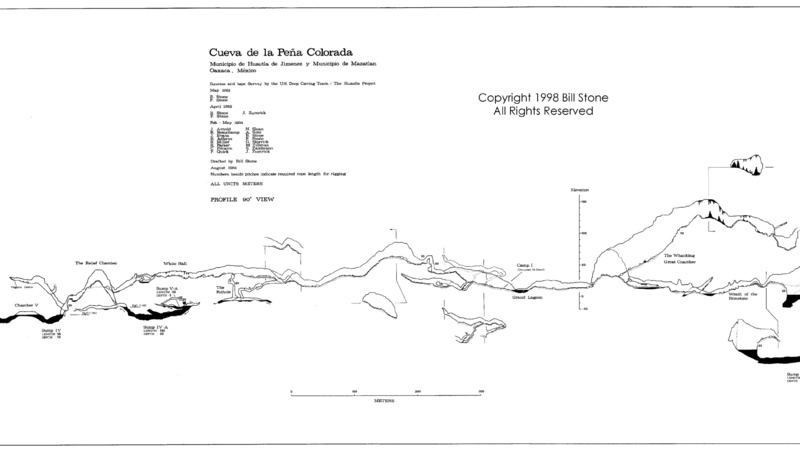 During this trip, Bill Stone and Pat Wiedeman were shown the entrance to the Cueva de la Peña Colorada, an enormous fossil resurgence cave that, in high water, still issued enough water from its entrance to fill a 20 meter wide arroyo. During the dry season it is possible to descend more than 30 meters vertically into the cave to where one quickly comes to Sump 1, the first underwater tunnel. 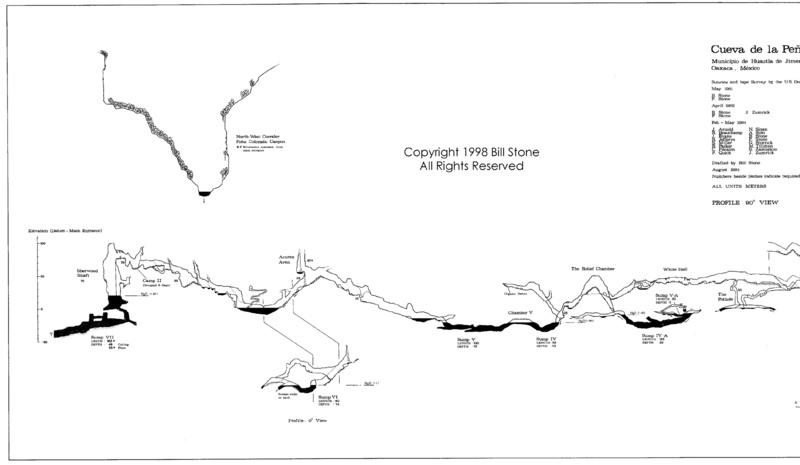 During a return in 1992, which included Stone, Wiedeman, and John Zumrick, Sump 1 was explored for 524 meters to where it opened into an air-filled tunnel. A further kilometer of dry cave, leading northward towards Sistema Huautla, was then discovered. Exploration was stopped at a second sump. Connecting this tunnel with the deepest known point in Sistema Huautla - some 10 kilometers away and 300m higher in elevation inside the plateau - became the primary objective of the 1984 expedition. An advanced high pressure composite diving system was specially designed and constructed for the expedition. The international team trained for 2 years in preparation for this expedition. It was estimated that 30% of the cave discovered on the expedition would be found to be flooded. Accordingly, plans were laid for establishing the first long duration underground camps located beyond flooded tunnels. Accomplishments: Expedition organization began in early February 1984 in Maryland. Final diving rehearsals were held in north Florida and further expedition stores were picked up in Texas before beginning the long trek to Huautla. By February 25th the expedition had reached Huautla, met with military liaisons from the Mexican Army, and moved on to San Miguel Huautepec where the real work began. Two hundred Mazatecs were hired along with 65 burros to transport the 8 tons of provisions, camping, caving, and diving gear down into the Peña Colorada canyon. Within three days basecamp was set up and diving operations began. Clark Pitcairn and Gary Storrick quicky passed the 14 meter long Sump 2 and went on to discover 200 meters of dry borehold leading to Sump 3. Rob Parker and Bill Stone subsequently explored Sump 3 for 190 meters (20 meters depth) to a giant air filled dome. Parker led a 20 meter exposed climb up one wall to the passage continuation and, on a solo reconn, discovered the "Whacking Great Chamber" some 200 meters further on. 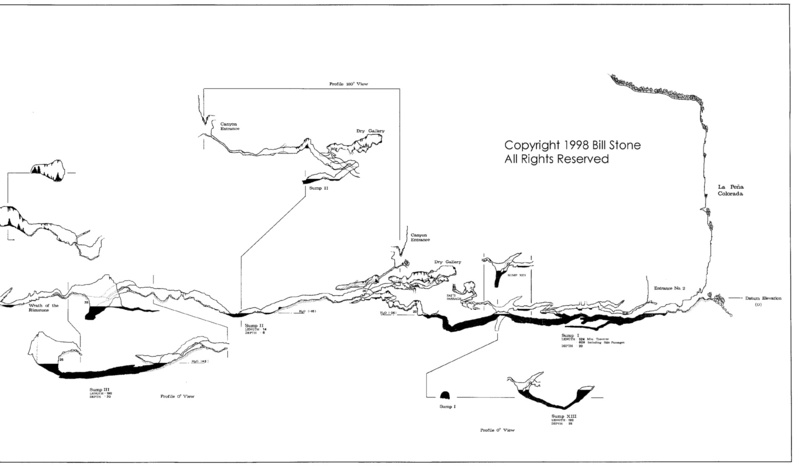 Following a subsequent 26 hour push from the entrance it was decided to establish Camp 1 just beyond the Grand Lagoon (see map), approximately 1.5 kilometers from the Canyon Entrance (discovered by Pat Wiedeman during the 1982 reconn). Bob Jefferys, Clark Pitcairn, Noel Sloan, Gary Storrick, John Evans, and Rob Parker spent 9 days working from Camp 1, during which they explored an additional 2 kilometers of tunnels leading north to Sump 4. Clark Pitcairn explored Sumps 4 and 5 on a solo dive and surfaced in the dry galleries beyond before returning. Rob Parker and Noel Sloan then continued on from there to Sump 6. 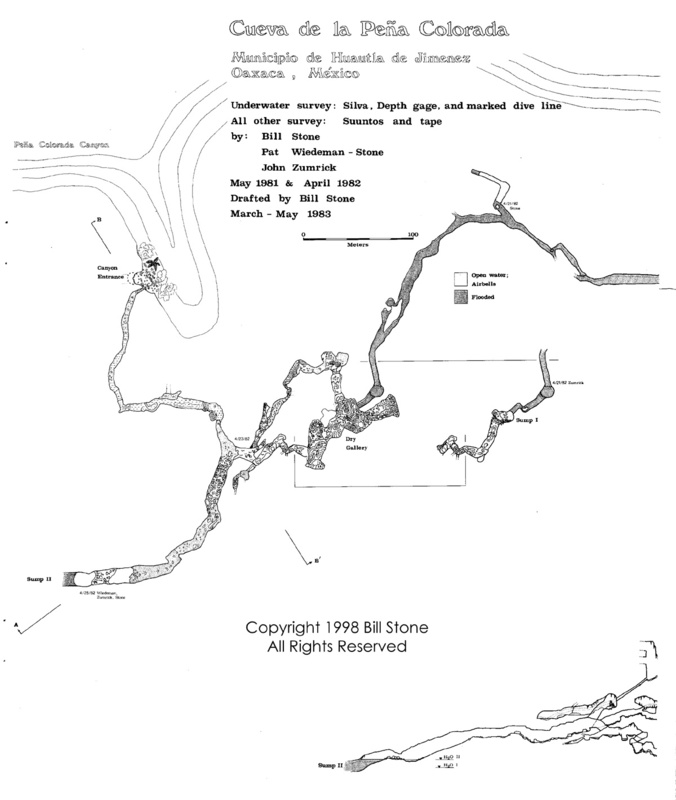 Parker and Jefferys, on a final push, soon came upon a deep shaft - later measured at 55 meters freefall - which led directly into Sump 7, the northernmost tunnel in the Peña Colorada. There the rapid pace of the expedition came to a halt. A 4-day second push from Camp 1 was fielded by Jefferys, John Zumrick, Wiedeman, and Stone, during which Jefferys and Stone returned to Sump 7. 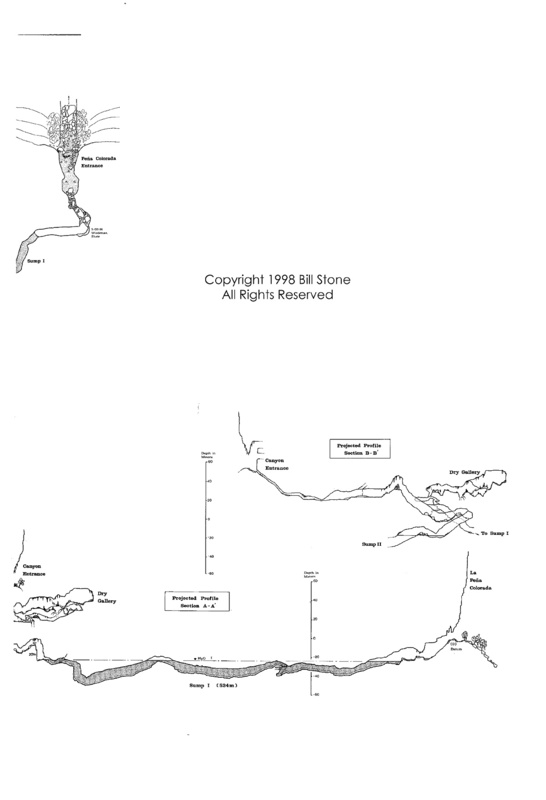 With Jefferys assisting with the in-water kit up (there was no dry land at the base of the 55 meter shaft) Stone explored downward through a boulder choke to a depth of 40 meters to where the main tunnel continuation was discovered. The water temperature, for the first time, dropped from the average 23°C in the Peña Colorada to 16°C, the average temperature of Sistema Huautla, thus signaling a connection with the active flow leading to the resurgence spring. A final push 10 day push from Camp 1 began with the intent of supporting Zumrick and Pitcairn (the two best divers on the team) to make a long penetration at Sump 7. Using the team's supply of 72 composite tanks, these two finally reached Sump 7 with 5 tanks. Their exploration to 165 meters in at 55 meters water depth was the furthest point reached during the expedition. The tunnel still continues 13 meters wide by 10 meters tall at that location. Later surveying on the surface revealed this location to be crossing 200 meters directly beneath the floor of the Peña Colorada canyon. A total of 7.8 kilometers of virgin territory leading into the plateau were surveyed on this expedition with 1.4 kilometers of this distance totally underwater, comprising 7 sumps, the longest of which was 524m in length. The expedition established the first subterranean camp set beyond an underwater tunnel. Camp I, set beyond 3 underwater tunnels, was occupied for 23 days; Camp II, set beyond 6 underwater tunnels, was occupied for 6 days. The logistics of apparatus transport (a pyramid supply system) and problems with nitrogen narcosis in the final underwater corridor led to a decision to retreat. This expedition directly led to the founding of Cis-Lunar Development Laboratories, Inc. to build a long range closed-circuit backpack for exploration diving. The prototype device was subsequently tested during the 1987 Wakulla Springs Project and was called the MK-1.